Also a HUGE Thanks to all of the promoting blogs! Are you worried about the security of your home or office? Searching for cameras for monitoring or surveillance? 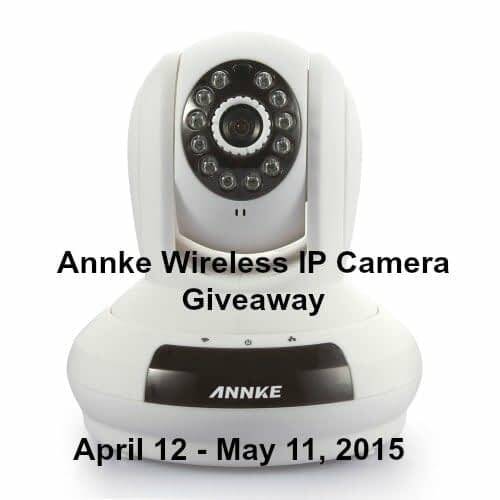 The Annke IP Camera gives you security while you are away from home. After hooking this camera up, so your wireless network recognizes it, you are free to place almost anyplace you need it. Then you can check on what the camera is seeing through your smartphone or tablet. Check on the baby while you are downstairs. See what the kids are doing, the babysitter, or the pets. It has premium 720p HD video quality so you will be able to see clearly and is ideal for 24-hour monitoring. Super easy to set up with only 3 steps. One of the steps will be to download a user-friendly MIPC gateway. With this you can view real-time feed of almost every corner in your home. You will have access to zoom, pan 350 degrees, and tilt 100 degrees the camera, with your phone or tablet. 1.0 megapixel lens capable of streaming video at 1280 x 720p HD quality. The camera adjust automatically for day/night but you can manually adjust it also, through their app. This is so easy to set up even I can do it! I needed this a few years ago when someone was stealing out of our freezer on the back porch. I tried a hunting camera but this camera was exactly what I wanted. I would have given them the food I just wanted to know who felt they had to steal it. Now wouldn’t this be nice to own? Want a chance to win one just like what I received? Well let’s get to it then! This giveaway is in no way endorsed, affiliated, or associated with Facebook, Twitter or any other Social Media Networking Site. You are not eligible if you have won a prize from the sponsor in the last 12 month. First two entries are mandatory, remaining are optional. The more you do the better your chances are. Disclaimer:The sponsor is responsible for shipping of the prize. Work Money Fun or other blogs associated with this contest are responsible for prize fulfillment. If you would like to be a sponsor in a giveaway like this please email Laura Smith at las930 (at)gmail (dot) com.